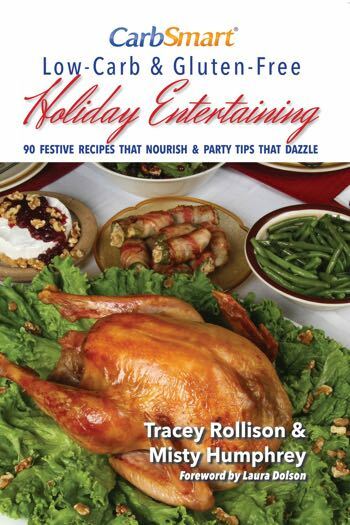 90 Festive Recipes That Nourish & Party Tips That Dazzle by Tracey Rollison & Misty Humphrey. Are you tired of hosting holiday parties that leave you unable to eat any of the food you’ve made for your guests? Suffer no more. With CarbSmart Low-Carb & Gluten-Free Holiday Entertaining by your side, you’ll finally be able to host the holiday parties of your dreams and eat everything you serve. The best part? Even your gluten- and carb-loving guests will shower you with compliments. Holiday entertaining has finally been made healthy. The book features recipes for every kind of scenario: breakfasts, brunches, luncheons, casual dinners, formal dinners, buffets, cocktail parties and more. There is no stone left unturned by Rollison and Humphrey—every aspect is completely taken care-of. In the back of the book, you’ll even find a complete menu for specific occasions, such as Thanksgiving or Valentine’s Day dinners. Breakfasts, main dishes, side dishes, appetizers, desserts and cocktail recipes are all included so that you and your guests will be well-fed no matter the party type. Everyone knows that the average person gains 10 pounds over the fall and winter holiday season, but you don’t have to be a statistic. Armed with CarbSmart Low-Carb & Gluten Free Holiday Entertaining, you’ll be ready to take on the holidays without the guilt but with all the flavor. You’ll be able to indulge in your favorite foods and still lose—or maintain—weight. Even if you’re headed off to a holiday gathering at a friend or family’s home, bringing along a recipe or two will assure you’ve got plenty of options so you can steer clear of the sugary, starch-laden treats and indulge in your own healthy options. Be sure to bring enough to share—and don’t be surprised when you see other partygoers opting for your dishes over the regular (ahem—boring!) stuff. From the tasty Wild Blueberry Belgian Waffles to the Chicken Salad Waldorf Bites and the Flank Steak Pinwheels, each recipe is maximized not only on taste—but on aesthetic pleasure, too. Your guests will be impressed before they even take their first bites of your offerings; the tasting will just seal the deal. Your appetizers will be the talk of the town as they travel to their party destinations. You’ll become used to hearing, “Oh wow,” “Oh my,” and “oh goodness…” before dinner is even served. By the time dessert time rolls around, you’ll be glowing. And cocktails? Mocktails too? You’ll be a gluten-free and low-carb entertaining guru and you’ll feel like you’ve spent your whole life doing it. Price includes free shipping in the US.